CNN spends some digital ink talking about a world-wide survey of countries’ reputations in this article here. It’s an interesting read, even though (or partly because?) it’s a short article. Canada and Japan tied for fourth place. The rest of the Top 10 is Italy at No. 7, Switzerland at No. 8, Australia at No. 9 and Sweden at No. 10. No non-Western countries managed to crack the Top 10. “No non-Western countries”, eh? Australia is #9 on the list, and they’re in the eastern hemisphere. But Australia, while geographically closer to Asia than Europe, is culturally closer to Europe than Asia, so maybe that’s what they mean. But look at who’s #4 on the list: Japan. The Land of the Rising Sun is as east as Eastern gets. What they mean is that no developing nations are on the list, only those with advanced economies. But nobody wants to be part of an undeveloped economy, so of course the list is going to be exclusively advanced economies. The “non-Western country” observation is either simply wrong (geographically or culturally “Western”) or meaningless (“Western” as a synonym for advanced economy). It’s not that Asia is undeveloped, it’s that undeveloped economies are undeveloped. The non-Western country quip is meaningless except to the extent that Western ≡ advanced is a racist presentation of the banal equivalence advanced ≡ advanced. I seem to be bereft of interesting prose to spout, so here’s a link dump instead. File-sharing based Kopimi (as in, “copy me”) recognized as a religion in Sweden. Interview with the founder. Witness some software management failure recorded in a bug log. Growing up in postindustrial Wales. How the Dutch got their bike paths — they fought hard for them. African development’s killer app: Cell phones. When I read about someone putting the pin in a dropped grenade, I think “Why is he doing that? He’s going to die! No, this didn’t happen, it’s just made up by a hack who doesn’t know how grenades work.” Congratulations, you just destroyed the immersion in your story. Similarly for a grenade exploding while still held pending the throw, or a thrown grenade with the spoon still against it (for graphical media). No need to trek through the snow to the library, research is now as simple as visiting http://en.wikipedia.org/wiki/Hand_grenade from the comfort of home, yet curiously, this seems to be a disease of newer works, despite older works having hand grenades in their stories if anything more often. Anatomy of a hand grenade: The body of a grenade is a shell containing explosives and a timed fuze. Against the shell is a lever called the spoon, which is connected to a spring-loaded trigger called the striker, which starts the fuze. A safety pin holds the spoon in place. Operation: Hold the grenade in your throwing arm, pressing the spoon against the body. Pull the pin. Throw the grenade at the enemy. With the pin removed, the spring will now push the spoon away and the striker starts the fuze, which in a short time will detonate the explosive. Note that the fuze can’t be stopped, and it’s the spoon which triggers the grenade, not the pin. So a held grenade can be re-safed by replacing the pin, which might be the seed of the myth that the pin will deactivate a cooking grenade. 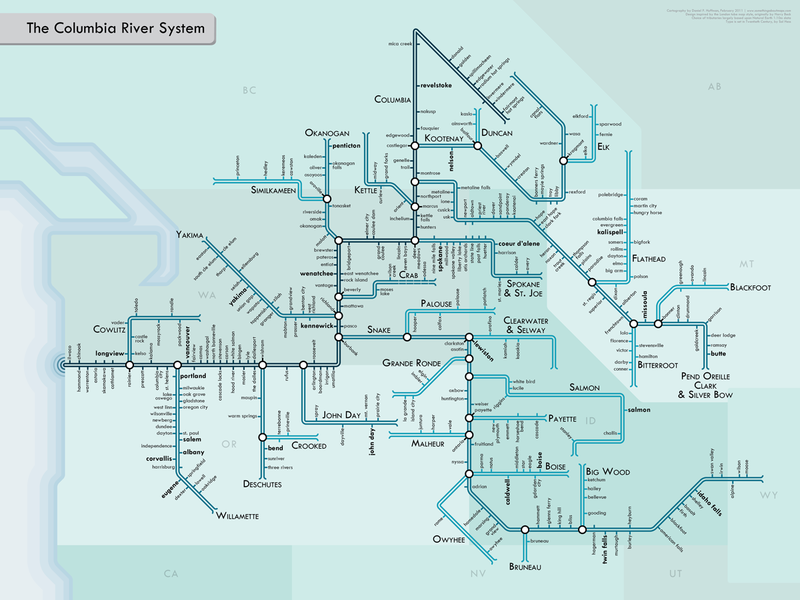 Daniel Huffman has produced some interesting maps of the US’s major river systems, done in the style of intracity rail line maps. I especially like the one of the Columbia’s system. He talks about generating these river maps here. Naturally, he has other interesting things to say about maps, such as a discussion on projection conformality. Centuries ago, we lived in ignorance, our vision dim, not even knowing what we didn’t know. Now and then some people struck sparks as we stumbled in the darkness, and saw something others had missed. But, on this day, a man was born who was to kindle a torch and connect heaven and earth. Though his work and teachings, he changed our worldview forever. He revealed truths and laws that mankind had had no conception of before. He turned our old notions upside-down with a new understanding of the heavenly realm, and of the world on which we live. His teachings have stood the test of time, still being taught, analyzed, and widely used in practice to this very day. The great thinkers of later ages have taken what he revealed, and built magnificently upon it, each generation using the work of the previous to go further. It’s the twenty-first century. Where are the flying cars? The videophones? What about the robot barbers and tailor engines? I’m kind of glad we didn’t get radium fireplaces though. More images of the year 2000 from 1910 at the National Library of France. A friend of mine called this time of year the “hectic holidays”, and it’s absolutely correct. I love the getting together with my family, the Christmas feast, the time off… But the gifting is very stressful. It’s hard to pick out gifts for people, it’s hard to ask for gifts, and shopping is a huge pain: Even when you know what you want to buy, going to retail stores right now is an exercise in frustration. And then the effort is wasted because they’re out of stock! How many people can we get together under the idea that Christmas is better off without the gifts, so we can focus on nobler ideals. Can we make Christmas a holiday that’s not about commerce, but a celebration of our brotherhood with our fellow man?